So to finish up 2017, I spent time during my holiday break reading 3 new books about meetings. As always, I learned something new from each of them. Mostly, though, I found myself feeling a bit overwhelmed and frankly, inadequate. :( There are so many things to get right! So many interesting and nuanced techniques to learn! So very many ways that meetings can go all screwy! How is it that an activity we all take part in so often, that drives so much of our collective work, and that most people feel very little need to spend any time or effort trying to master - how can this be so very complex? The number of things you’re supposed to know if you want to lead a good meeting can be quite daunting: establish ground rules, sit in a circle, arrive early, send an agenda with pre-work, start with a check-in, break into smaller groups, cover the most important topic first, assign a timekeeper, use a parking lot, ask three part questions, end early, hear from everyone, keep it short, share appreciations… the list goes on and each tip is a good one! Good tips for leading good meetings… and good luck remembering all that! In the research world, they survey people’s feelings about a meeting and report the findings using one of two acronyms: PMQ (Perceived Meeting Quality) or PME (Perceived Meeting Effectiveness). As far as I can tell, they use these concepts interchangeably. 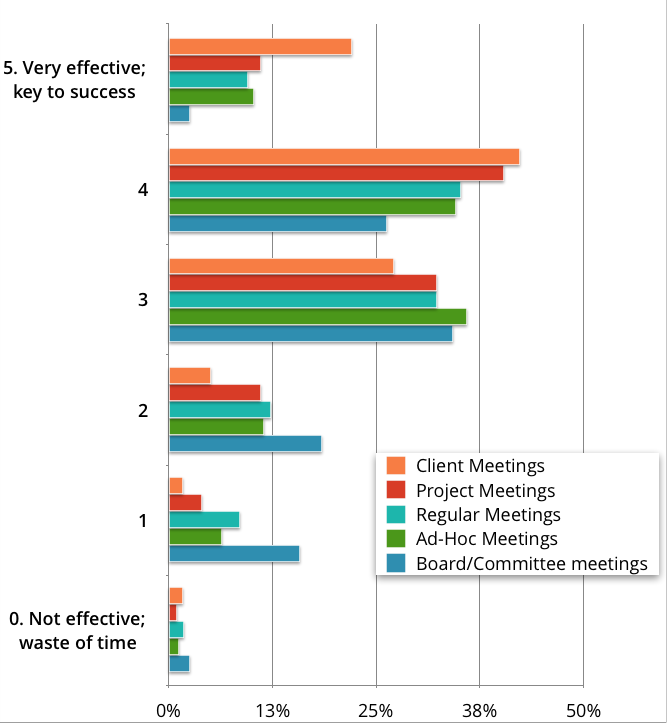 In our survey, we ask about perceived meeting effectiveness as well, but not for meetings in general. Instead, we ask people to rank meeting effectiveness for different types of meetings they attended in the past two weeks. Looking back at it, I now find this use of the word “effective” a bit confusing, because we aren't asking people about whether these meetings accomplished anything. Remember, people say they want clarity about the meeting they attend and clear results. If a meeting has a high PME, where were those clear outcomes that people claim to care about most? I think it’s very hard to say that a meeting was effective unless you can say what it was effective for. It’s like describing a wonderfully effective cure, but failing to explain whether it’s a cure for a broken arm or an upset tummy. Calling something effective assumes that the context is known and that it is effective for achieving some goal; an effective technique for lifting heavy objects, an effective strategy for getting out the vote, an effective meeting for finalizing a contract, or an effective treatment for a broken arm. Hint: Ginger ale is no good for broken arms! And asking a prospective client to agree to your ground rules at the start of a sales call meeting isn’t really a great idea either. There is a lot of advice out there about running “effective” meetings (even here on this blog) that doesn’t deal with what the meeting is meant to accomplish. Most advice about meetings tells you how to do the work in meetings rather than how to use the meetings in work. Clarity Means Knowing Why: What is this meeting for? We also asked people to share stories and insights. Here’s a response from our survey. 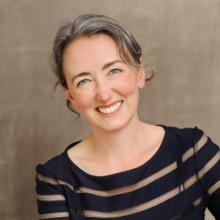 "Several years ago I attended a 1 day workshop called "Facilitating for Results." The seminar was all about preparing for, and facilitating effective meetings. I've used the techniques from this seminar ever since, and have shared several of the key concepts / tools / techniques, with many of my colleagues. One of the most important take aways was to start by identifying the purpose and desired outcomes, and to include both in the meeting invitation. The agenda and attendee list will naturally follow. Prep work will also become clear once you know what you're trying to accomplish with the meeting!" When you start with the purpose and desired outcomes—or the “why” of a meeting—yes, you’ll more easily discover the agenda and attendee list. You’ll also know which of the many meeting tools and techniques apply. It turns out that you don’t actually need to remember that whole big list of best practices for every meeting. Those aren’t requirements - they’re ingredients. The ones to use will depend on what you’re cooking. Reviewing our survey responses this week helped alleviate some of the anxiety I felt after reading all those meeting books. Yes, there are some rules that should be followed for every meeting, just like there are some rules in the kitchen, but this list isn’t so intimidating. In the kitchen, keep things clean and bring food to a safe temperature. In meetings, the basic rules include being clear about why you’re there and confirming outcomes before you leave. No, the basics aren’t enough to give you a truly engaging meeting or a delicious meal, which is why we turn to our recipes, but only the ones we need for that day. I realized that I know how to cook, so what does it matter that I can’t remember all the recipes in every cookbook? Similarly, there’s no need to remember all the tips and techniques in every meeting guide. That’s why people write things down - so we can look them up when we need them! Going forward in 2018, the Lucid team will continue to share what we learn about designing meetings that are not only good meetings, but meetings that are good for something. We have some inspiring meeting templates coming that will teach you how to achieve your goals, and exciting plans for the Lucid software platform to make it easier than ever to run the right meeting at the right time. All of which we’ll be sure to capture in a way that makes it easy for us all to look it up when we need them. For now, take a moment to get grounded in what matters most. Here’s a word picture of answers to our first survey question. What do you feel makes a meeting worth attending and a good use of your time? Here's the full text of survey answers so you can draw your own conclusions. There are many wonderful ways to do great work in meetings. This year, let’s put those meetings to work.